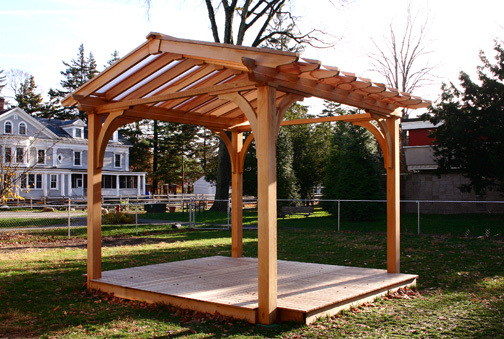 Designed for a day care center at Smith College, this peaked top structure was created to protect children from sun, rain and to provide a raised and dry deck for play. Several interesting design aspects were incorporated into the final solution. 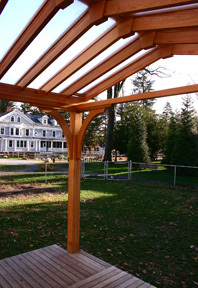 In order to facilitate year round use of the pergola, we placed frosted acrylic panels into a peaked rafter system. 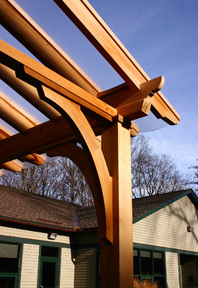 The panels are concave to allow for shedding of water and snow without any seam leaks. 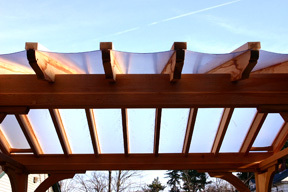 Under the acrylic and attached to the rafters, will be placed a 60% UV filter shade cloth, which can easily be removed if sunrays are desired during winter months. 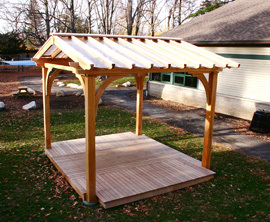 The deck was created in three modular sections and installed in two hours.